When to drop products and how to balance work/life. Tina Seelig is the executive director of the Stanford Technology Ventures Program, where she teaches courses on innovation and entrepreneurship. 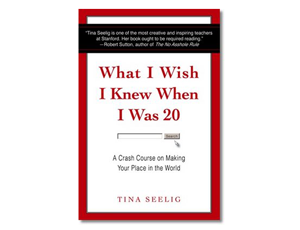 Her newest book is titled, What I Wish I Knew When I Was 20: A Crash Course on Making Your Place in the World. Here are five questions and responses from a recent interview I conducted with Seelig. When should a company give up on a product or service? This is always a hard question. We all know that in order to be successful you have to put in an enormous effort, and many people work for years before their ventures look like overnight successes. Even when others suggest that it is time to cut your loses, you know that with more time you will be able to make it work. However, this can only happen when you are completely committed. If you have lost your passion, it is time to quit. Without a strong drive to succeed, there is no way you will have the energy to ultimately reach escape velocity. experience, one key to leading others is to "paint the target around the arrow." That is surround yourself with really sharp people — arrows — and make sure that they are doing what they do best. If you empower really talented people to do what they do best, then astonishing things happen. Everyone feels that they are doing the easy job and truly appreciates what everyone else is contributing. Also, figure out what motivates each individual on your team. With that knowledge you can put incentives in place that encourage each person to deliver their best. What's the best way to fix mistakes? Answer: It is important to correct mistakes quickly. The longer they linger, the bigger they get. I tend to take lots of risks, and therefore have had lots of opportunities to correct my errors. I find the best approach is to acknowledge the error and move on. If possible, find a way to quickly demonstrate that you have learned from the experience. What is the secret to successful negotiation? Make sure that you understand the other person's point of view. If you make assumptions, you will very likely be wrong. When I bought a car for my son, I assumed that the salesperson wanted us to pay the highest price. That wasn't the case! After asking a bunch of questions, I learned that his commission wasn't based on the price of the car — it was based on the scores he got on the customer evaluation form we filled out afterward. Of course, I was happy to give him a great score in return for a great price. This is how win-win negotiations come about. How does one balance work and "life"? You copied a quote from my book into one of your recent blogs. That quote, attributed to the Chinese philosopher Lao-Tzu, is very powerful. "The master of the art of living makes little distinction between his work and his play, his labor and his leisure, his mind and his body, his education and his recreation, his love and his religion. He simply pursues his vision of excellence in whatever he does, leaving others to decide whether he is working or playing. To him, he is always doing both." This is what we should all aspire to — having work that enriches our lives and lives that enrich our work. On the path to this perfect balance, it is best to pick three things that are most important to you and focus on them. This list will change as your priorities change and is a reminder that you can do it all — just not at the same time.